i am trying to start bowling with a higher backswing to get my ball speed up. my only problem is i can't seem to aim it very well (i pull it a lot). so any ideas? the reason i thought i could get more speed is one because some one told me it would, and i see this guy on our team with a really high backswing and he's about 4 inches shorter than me and not any bigger and he throws 18 mph for a strike while i am at around 11-12 mph. Last edited by mrbean on Tue Mar 28, 2017 11:01 pm, edited 2 times in total. It is a common misconception, even to coaches, that a higher backswing will produce more ball speed. It can a little bit but if it is forced it will do more damage than good by messing up your timing and accuracy. Speed comes from the legs. Post a side video and I will show you how to get more speed. If you don't believe me look at two handers, they have a very low backswing and very high speed, it's a combination of their tempo, foot speed, power step and timing. One of the most common causes of "pulling it" is late timing. Higher backswing equals more speed , I wonder what Pete Weber thinks of that ? Pete doesn't have what I consider even above average ball ball speed ,so lets throw that notion out . you should post a video. my only problem is i can't seem to aim it very well (i pull it a lot). What I'm thinking (without a video to go on) is that the swing is getting to the foul line before you are done with your slide. You should post a video! How are you creating a higher backswing? There are many ways and most are wrong. you should post a video just saying. 2) Keep you same swing but slow down steps 1 and 2 .
mrbean, take a look at the ETBF videos that were thoughtfully added to the wiki. It is well worth your time. They can also be found on youtube. The presentation at the ITRC video is also available in segments. The second video by Mohamed Janahi also contains textual passages and later on in the video text overlays on some video. It would also profit you to look at some of the Kegel Teen Masters instructional set of 10 videos. Pete Weber came immediately to mind. Excellent contrast to the compact swings of the two handed set. 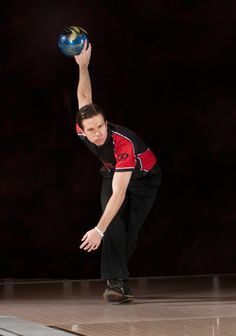 I believe Juha and Onder make very credible and excellent points in the ETBF presentation and I wish their teachings would get more exposure in the U.S.
As you watch SOME elite bowlers you will see deviations from best practices. However they are elite and rare athletes with the innate ability to succeed, despite deviations from what is commonly espoused. Also, I've always thought that most aspiring bowlers should study successful female bowlers. By and large, they are not using a lot of muscle. Kudos to the good advice already posted! !